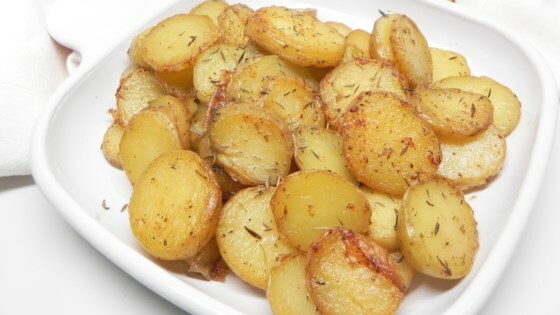 "Try these absolutely crispy, creamy, and garlic-infused melting potatoes for a quick and easy weeknight side dish in your Instant Pot®." Turn on a multi-functional pressure cooker (such as Instant Pot(R)) and select Saute function. Melt butter. Add potato rounds in a single layer and cook until golden, about 5 minutes. Flip and cook for 5 minutes more. Remove potatoes and set aside. Place trivet inside the pot. Pour chicken broth and season with thyme, salt, and pepper. Add garlic; cook for 1 minute more. Place potatoes on the trivet; close and lock lid. Select high pressure according to manufacturer's instructions; set timer for 1 minute. Release pressure carefully using the quick-release method according to manufacturer's instructions, about 5 minutes. Unlock and remove lid. Remove potatoes from the pot. Reselect Saute function and cook chicken broth and butter mixture until slightly reduced, about 2 minutes. Place potatoes back to pot in a single layer, and cook again until golden, about 3 minutes per side. Serve immediately.